Frolicking Bear Cub, originally uploaded by Thomas Gehrke. Memphis was pretty toasty in May and since we are well into Fall at this point, I'm already missing the warmth. 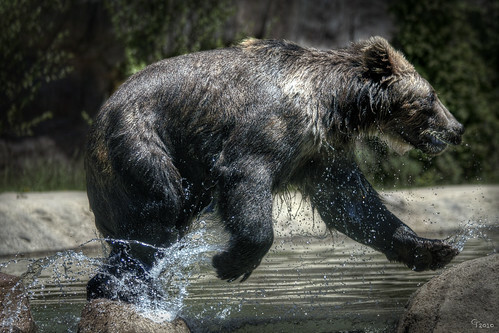 This bear cub wasn't feeling the heat at all as he romped in the watering hole that the zoo had provided for him and his brother. Or sister or cousin. I'm not really up on the genealogy of this particular bear family. Not that I keep up with other bear families, mind you. Needless to say, get me near water with a camera and I am all over it. Throw in a cute animal (yet still dangerous, I'm sure) and one can hardly go wrong in my book. Well, hopefully not. And thank goodness for long lenses. So this picture got the Photomatix treatment to increase the tonal range. (Frankly, I believe a curve adjustment in Photoshop would have done just as well.) I then added a very slight lens blur to the background to add to what was already there because I felt that it was still a little distracting. Some burning of the background and edges to make the bear stand out and a bit of Topaz Detail 2 in spots (mainly the face and water splashes) finished things up.